I recently purchased a 2017 Macan in Midnight Blue. Absolutely love the car! Pic below from Twin Lakes. My only major annoyance so far - I was walking to the parking lot after a meeting and noticed from afar that my trunk was open! For the 4th time already (4-5 weeks into ownership), the trunk button on my key got pressed in my pocket. And no, it's not what you're thinking - my pants are a very normal tightness :P There is no delay built into my button - a single light press is instant open. Apart from the security issue of having my new car wide open, I was also very concerned about the various concrete barriers and walls I back up to when I park. Any closer and my hatch would've been all scraped up in this case. After about 2 more weeks of paranoia every time I walked away from my car, or whenever I was sitting somewhere within key range, I decided it was time to take some action. I searched around the internet and I couldn't find a solution specific to this key. So I decided to make one! Here is how I made my button much, much less sensitive – I've had no issues since. Taking the key apart is simple. Be careful before you remove the battery so you don't hit it while your car is in the garage! Here is a good video example on how to disassemble the key. Here's where you need to be careful. Use something sharp (I used a razor blade) to take off a very flat piece of the nub on the underside of the trunk button. I did about 2mm as you can see in the picture below. To be honest, mine is a little lacking in sensitivity now (I have to dig my nail pretty hard to get it to go) - so probably start with 1mm if possible and test it out. That's it! 2 simple steps and it should be all cured. I've had no issues since making this tiny modification - hopefully works for you too! 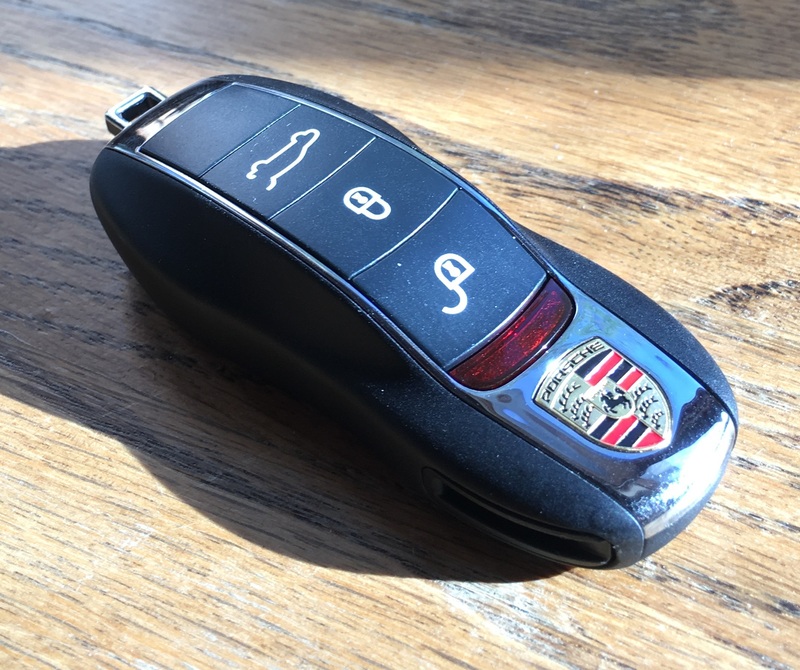 **Michael is not a certified Porsche technician or representative and is not responsible for any damaged keys . Perform the steps detailed in this guide at your own risk! Michael Surges cannot be held responsible for any damage caused as a result of this guide.